Blue 1 continues to deliver excellent on-time performance. In 2012, the Blue1 monthly average improvement of departure punctuality is above 7 p.u., which is to be considered as a major improvement. Blue1 punctuality represents currently top European on-time performance. During the last three months, the percentage of Blue1 flights departing on-time is well above 90% (92.3% in July, 95.5% in August and 94.7%. Punctuality and regularity are a key operational Blue1 priority. Since autumn 2011, a considerable company-wide Punctuality and regularity initiative including a number of practical measures and service projects has been implemented within Blue1 in order to reach a long-term top position with best-in-class on-time performance. Blue1 became the first airline in Finland (IATA) to pass IOSA approval in 2006. The IOSA renewal audit is organized every second year. During the first half of 2012, Blue1 was the number four airline in the world to participate in the enhanced IOSA audit. The Blue1 IOSA was reapproved with high compliance of all audited requirements. The IATA Operational Safety Audit (IOSA) program is an internationally recognized and accepted evaluation system designed to assess the operational management and control systems of an airline in relation to safety. AS Group subsidiary Blue1 converts its business concept to a production company, with the primary task of delivering flight services to meet SAS’s and other airlines’ and tour operators’ operational needs. “From November 1st, Blue1 as a production company will be focusing on its operational strengths and continuing to operate its current routes for SAS. Our punctuality is the best in Europe and our focus on high-class service is greater than ever. Blue1’s fleet of Boeing 717-200 jet aircraft enables cost-efficient operations across Europe, Nordics, Baltics.” says Janne Hattula, Managing Director & COO of Blue1 since July 2012. 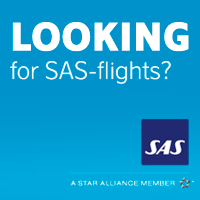 Blue1 is a Finnish airline based at Helsinki Aiport and a member of SAS Group since 1998. The fleet consists of 9 Boeing 717 aircraft and the the number of employees is 350. Blue1 operates under Finnish AOC and is IOSA approved with ISO 14001 and EMAS certified operations . 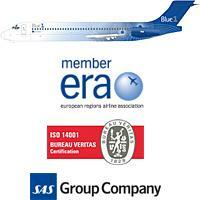 Blue1 is also a member of IATA and ERAA. During this year Blue1 will renew the cabin interior of its Boeing 717 fleet. The first Boeing 717 with a new and modernized cabin interior is already in commercial traffic. The most visible change is new leather seats. They feature a light-grey color making the cabin look bright and more spacious. The new seats also offer more leg room. Other cabin interior materials will also be renewed as well as lighting of the cabin. The modernization of the cabin interior is part of Blue1’s new in-flight concept and service design, bringing more joy and comfort to traveling. It also completes the graphic design theme of the Boeing 717 fleet.